Ghanbari was arrested during the protests. After being detained for five days in the so-called quarantine center of Tehran's Evin Prison, he died on his 22nd birthday. Prison authorities told his mother Fatemeh Malayan Nejad that her son had killed herself. "My son called me from jail and told me they beat him up," Nejad tells CNN. "It's a big lie that he committed suicide, and I will not rest until the truth comes out." Ghanbari's mother says she believes he was murdered. 1 lawyers, 50 media workers and 91 students were arbitrarily detained. The Iranian government has not responded to CNN's request. 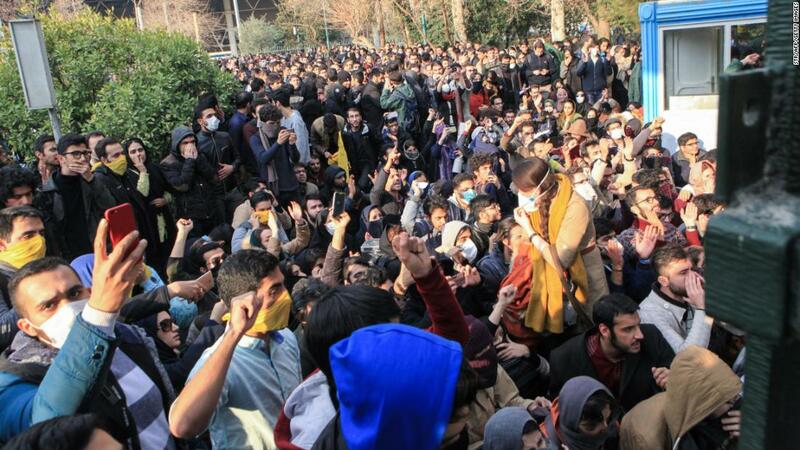 But Iran's protest movements show little signs of weakening. As the security forces reinforce their actions, dissidents continue to conduct demonstrations. Experts say that the repression of Iran may have encouraged activists instead of dissuading dissent. "Protesters feel they have nothing to lose," says Mansoureh Mills, Iran researcher at Amnesty International. "Over the past year, thousands of workers across the country have been scared because they have not been paid for months and are struggling to feed their families." But while the Green Movement attracted far more people, the geographical scope of the 2017 and 2018 protests surprised the authorities, who were largely outside the capital, gathering in major northeastern cities – like the conservative ones Fortress Mashhad – and in the provinces – they also came largely from the working class of the country – both demographics For a long time they were regarded as centers of the popular base of the regime. "Noteworthy was the geographical spread," says Mohammad Ali Shabani, Iran Pulse's editor at Al-Monitor. "Equally remarkable was the lack of elitist support: in addition to general sympathy for demands such as more jobs and lower consumer prices, there was no important political camp among the demonstrators." Despite the regime's violent reaction to the first demonstrations in 2017 and 2018, individuals and coordinated groups of dissidents publicly called for political and social reform throughout 2018. Peaceful demonstrations took place in July and August as Iran's economic crisis deepened These authorities scattered live ammunition, tear gas and water cannons, according to Amnesty. Teachers in Tehran held protests in October and November, resulting in 23 arrests and eight prison sentences. By the end of the year, 467 workers, including truckers, factory workers and teachers, had been interrogated by the authorities or subjected to torture and other ill-treatment. "(The raid) is the worst we've seen in the last decade," says Raha Bahreini, Iran researcher at Amnesty International, to CNN. 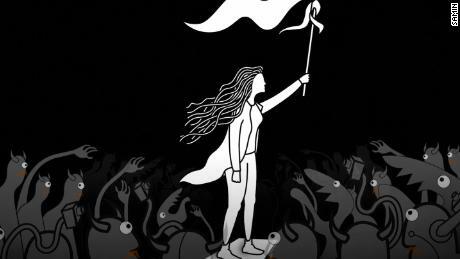 Perhaps the most prominent social movement that gained momentum in 2018 was protests against Iran's compulsory hijab. 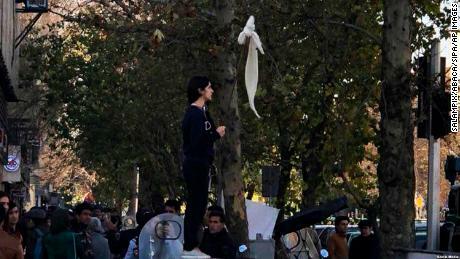 On December 27, 2017, Vida Movahedi, a The 31-year-old Iranian mother climbed onto a supply box in one of the crowded streets of Tehran and silently waved a white bandana on a stick. She stood undisguised and her long hair fluttered in the breeze. Movahedi was arrested a few hours later, but a photo of her lonely act became viral. The image helped spread the "White Wednesdaydays" social media campaign of Iranian Masih Alinejad. The movement encourages people to protest against the obligatory headscarf law by wearing white on Wednesday or going out. Through her campaign, Alinejad receives photos and videos of these demonstrations. She then splits them together on her social media accounts with more than 2.3 million. Within weeks of Movahedi's act, women across the country were filming in solidarity on busy streets. At least 112 activists had been arrested or detained by the end of 2018, according to Amnesty. Despite the arrests, the white Wednesday movement continues today and shows no signs of fading. Shaparak Shajarizadeh, 43, an active member of the movement, was arrested three times in 2018 before he fled to Turkey and applied for asylum in Canada. She was detained for the first time on February 21 because she had shown a video about herself that reflected Movahedi's demonstration. 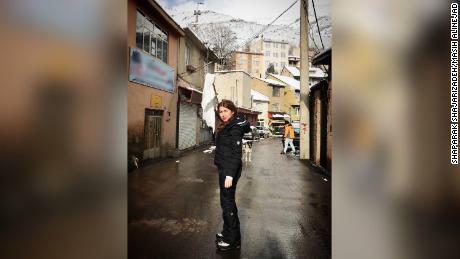 "I was beaten at the Morals and Security Bureau, and then they put me in solitary confinement, went on a hunger strike for a week, then I was released," Shajarizadeh told CNN. "After that I received threatening phone calls – they told me to stop putting my pictures online and to talk about the mandatory laws of the hijab." Nasrin Sotoudeh, a prominent human rights lawyer and women's rights activist in Iran, has taken up the case of Shajarizadeh. While waiting for the conviction, Shajarizadeh was again illegally detained in March and May. She says she was tortured, threatened and thrown into Evin Prison. "I was charged with corruption and prostitution for putting pictures online without my hijab," says Shajarizadeh. "They told me to drop Nasrin Sotoudeh as a lawyer – threatening me to file charges against the country for national security if I kept them." Shajarizadeh was sentenced to 20 years in prison, 18 of whom were suspended. Sotoudeh was arrested on 13 June 2018 for defending several demonstrators against the hijab. She is confronted with charges of national security that could sentence her to more than a decade in prison. According to the Center for Human Rights in Iran, she is denied the visit of her family. On January 23, Sotoudeh's husband, Reza Khandan, also a prominent human rights lawyer, was arrested and sentenced to six years in prison for security reasons. Both are now suing for their charges. High-ranking US government officials allied among them throughout 2018 President Donald Trump and Secretary of State Mike Pompeo – repeatedly with Iranian demonstrators to further isolate the regime. 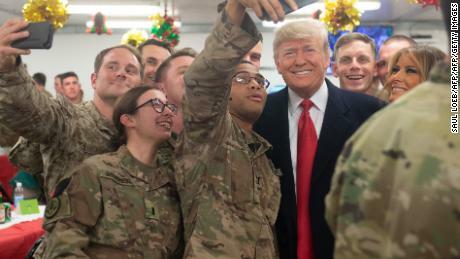 During the wave of demonstrations in January, Trump tweeted: "The people of Iran are finally acting against the brutal and corrupt Iranian regime." The president warned the US to look closely before declaring, "It's time for a change." Pompeo seemed to have a personal interest in the anti-hijab demonstrations, tweeting 208 pictures of Vida Movahedi's protest at least twice a year in 2018. In June, he even published a graphic of Movahedi alongside a photo of Iranian Supreme Leader Ali Khamenei. The slogan "Iranians deserve respect for their human rights" stands above this image. The State Department also tweeted several messages in support of women's rights in Iran – all written on Farsi. In a speech at the Heritage Foundation in May 2018, Pompeo explained how the US wanted to proceed after Iran's withdrawal from the 2015 nuclear deal. Speaking to the crowd in Washington, he said, "The Iranian people will be able to make a decision about their leadership, and if they make the decision quickly, it will be wonderful." "If they choose not to, we will stick to it until we reach the results I set out," Pompeo continued. The cumulative effect of these measures has prompted Iranian President Hassan Rouhani to accuse the government of agitating openly for regime change. "Reducing the legitimacy of the system is their ultimate goal," Rouhani said in a speech on Iranian state television aired in October. Although more Iranians publicly voice their social and economic grievances, the absence of organized political problems The opposition in Iran has made analysts confident that the protest movements are not a serious threat represent for the regime. "We can expect further protests in the coming months as the economic situation worsens, but it is difficult to predict Given their lack of organization, the formulation of clear and consistent demands and the elite buy-ins they could lead" says Shabani from Al-Monitor. US Ambassador John Limbert, arrested during the 1979 hostage crisis and serving as Deputy Secretary of State for Iran in 2009, is confident that the regime will win. "In the Islamic Republic, the authorities always feel threatened," says Limbert. "They'll do what they have to do to stay in power, and if brutality requires it, it's the same, and if flexibility means they'll try that." "The same men's club has been doing things since 1979. Age catches up with them, they will last as long as they can, and it's clear they mostly have no idea of ​​the realities of their own society in which they live are creative, committed and educated, "says CNBC. On January 29th, the worldwide threat Assessment for 2019 was published by the US Director of National Intelligence Dan Coats. "We believe that Tehran is ready to take more aggressive security measures in response to the renewed riots," the document said. Just as the 2019 regime will be hot on its heels, including some of the demonstrators. A 38-year-old from Mashhad who participated in both the 2017 protests and the 2018 demonstrations, CNN says the White Wednesday Movement, despite being beaten, threatened and thrown in jail, has no plans in 2019 not to mention. "I will protest until the mandatory hijab law is lifted and until the Iranian people are free from this despotic religious regime," says the protester, who refused to reveal his name for security reasons. Amnesty International's forecasts for the coming year reflect his comments. "Iran is in an unprecedented crisis, rooted in a combination of severe political, economic, environmental and human rights issues," says researcher Bahreini. "We can therefore expect that the protests against poverty, inflation, corruption and political authoritarianism in the country will increase."